No annual fee travel credit cards are a rare breed. While all these extras more than compensate for the higher annual fees, sometimes it just doesn't make sense to pay one. So, finding a travel credit card that has valuable travel rewards, any type of insurance, and a few perks … all with no annual fee? That’s kind of like looking for Bigfoot – sightings are pretty rare. But no matter how rare, there are still a few Canadian no fee travel cards in the wild credit card market. 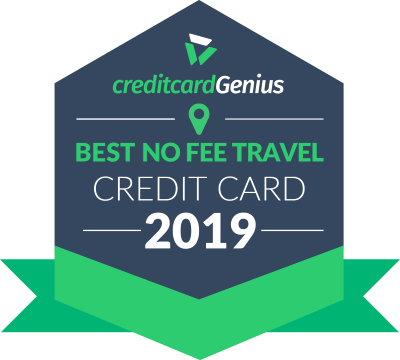 Let it be noted, however, that there are some no fee cash back credit cards that are better than no fee travel credit cards, so we included them in our list. They may not give you points or miles, but the nice thing about cash is that it can be used for anything – including travel. Review all top 10 no fee travel cards here. Why choose a no fee travel card? If you’re new to credit cards – no fee cards are a great starting point if points and miles are completely new to you. You get to figure out how everything works without any risk. If you don’t use your card for all your purchases – if you’re not using your credit card for the majority of your purchases, paying a steep annual fee may not make sense for you. Our general rule of thumb is if you spend $1,200+ a month on your card, you can easily justify an annual fee. However, if you’re unsure, feel free to enter your monthly spending into our spending calculator to see if the rewards you would earn would outweigh the annual fee you would pay. Otherwise, consider a no fee card. If you already have a premium credit card – some people like to pair no fee cards with premium credit cards to make sure that they aren’t leaving any rewards on the table. Perhaps you have an American Express that isn’t accepted, or you love shopping at Costco, but your Visa isn’t accepted there either. If that’s the case, perhaps a no fee Mastercard would be a good addition to your wallet. With that in mind, let’s take a closer look at some of the best no fee travel credit cards on the market. The best no fee travel card right now is the . And although it's a cash back card, last time we checked cash can be used for everything, including travel. Earn a cool 1.75% cash back on all of your purchases. But what really makes it stand out as a great travel card is earning 4% back on any purchases made in foreign currency. This offsets the foreign currency transaction fee of 2.5% and leaves you with 1.5% cash back on your foreign purchases – tops amongst cards on this list. One drawback – unlike other cards here, this one has high income requirements – either $80,000 personal or $150,000 household. So if you don't meet them then the other cards are better for you. The card is our number one Visa travel credit card with no annual fee on our list and for good reason: for a no fee card, it has quite a lot going for it. This card will give you an average return on spending of 1.72%. You'll earn 6 points for every $1 spent at participating More Rewards locations and 4 points for every other $1 spent – you'll be accumulating valuable More Rewards points in no time. 3 different kinds of purchase insurance – extended warranty, purchase protection, and price protection. Price protection is a very rare type of credit card insurance. It will reimburse you the difference in price if something you buy goes on sale in a predetermined amount of time. For a no fee card, the Scotia More Rewards Visa sure packs a big punch. 1 point for every other $1 spent, including any overages in the categories. And since 1 point = 1 cent of travel, you'll earn up to 2% back on your spending. While the does have a higher Genius Rating, it comes with a very high personal income requirement of $80K. The MBNA Rewards Platinum Plus Mastercard has no income requirement. Even more impressive is that you get 7 different types of purchase and travel insurance. In fact, all the MBNA Platinum Plus Mastercards cover you with the same insurance package. So, if you’re looking for a no fee card and insurance is important to you, MBNA is definitely a good place to start. 2,500 if you enroll for e-statements in the first 90 days. Who can say no to free rewards? The may not be on our list of best no fee travel cards, but it definitely has the best sign-up bonus for a no annual fee card. If you sign up before March 31st, 2019, you will receive 20,000 bonus BMO Rewards points worth $142 in travel – not bad for a no-fee card. With this card you can travel with peace of mind knowing you get travel accident insurance and up to 25% off at select National Car Rental and Alamo Rent A Car locations. It's not strictly a travel credit card, but the is a good one to consider if you’re looking for a no fee option, especially if the majority of your spending is done in a few purchase categories – say entertainment, restaurants, gas, or groceries. This card allows you to choose up to 3 spending categories where you do most of your spending and gives you 2% cash back for every purchase you make at stores that fall into those categories. And, if your spending habits change, Tangerine allows you to change your chosen spending categories at regular intervals. And although this card doesn’t give you points or miles, it gives you cash that you can use for whatever travel you like!